This article is about generic butterflies sometimes seen in the Mario franchise. For the microgame from WarioWare: D.I.Y., see Butterflies (microgame). 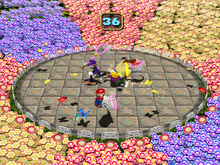 Butterflies appearing in Butterfly Blitz, a minigame from Mario Party 4. Butterflies are real world insects that appear in many games of the Mario franchise and usually do so in groups, often simply as a background element, such as in Super Mario World 2: Yoshi's Island. Flutters and other species from the Mario franchise are based on butterflies. Mario with two Butterflies in Super Mario 64. In Super Mario 64 and Super Mario 64 DS, there are a few stages (as well as outside Princess Peach's Castle) where butterflies fly around. When Mario punches or goes near one, one of two things will happen: the butterfly will either turn into a 1-Up Mushroom or become a black sphere looking similar to a Keronpa Ball or Big Steely and chase Mario until it hits him or hits something in its way; in either situation, it explodes. However, this only works in Tiny-Huge Island and Tall, Tall Mountain. In this game, butterflies are violet with white spots on their wings. In Super Mario Sunshine, Yoshi can eat certain types of butterflies to get different items. Yellow Butterflies yield regular coins, blue Butterflies yield Blue Coins, and green Butterflies yield 1-Up Mushrooms. In this game, butterflies are usually found fluttering around in groups, and are rarely by themselves like in Super Mario 64. In Super Mario Galaxy, butterflies are seen throughout various Galaxies. Even though they are used mainly for decoration, the player can collect a single Star Bit per butterfly by pointing the Star Cursor at the butterfly and moving the cursor around while still touching it, although this does not work while Mario or Luigi are on the Comet Observatory. In Super Mario Galaxy 2, a number of shimmering golden butterflies appear on the Starting Planet in the Sky Station Galaxy (three also appear on the Peewee Geo Planet later in the galaxy), but only while Co-Star Mode is active. The player can use the Co-Star Luma to spin the butterflies in the same way as they would any other object. When spun, each butterfly releases three Star Bits each, after which they disappear. They also disappear the second that Co-Star mode is deactivated, though when it is used again, they return. If spun by the Co-Star Luma, they are gone for good. These golden butterflies also appear on the Earth Planet, the Yoshi Tower Planet, the Fossil Planet, the Solar System Planet, and the Cone Planet in the Yoshi Star Galaxy. A different variety of butterfly also appears on the Stone Mountains Planet in the Fluffy Bluff Galaxy. These particular butterflies are purple which are present for decoration only. The Lost Kingdom in Super Mario Odyssey is home to a large number of multicolored butterflies, which are mostly found in colonies that will slightly scatter when Mario invades them. Apart from the ornamental butterflies, there is also a considerably larger, glowing butterfly that holds a Power Moon. It is always found east from Rocky Mountain Summit, resting on the edge of a narrow cliff jut. It will fly away if Mario comes close to it, returning to the same spot after Mario leaves. The Power Moon can only be obtained by throwing Cappy at the butterfly. There are also butterflies that resemble large whites and swallowtails in the Wooded and Mushroom Kingdoms, respectively. Butterflies serve as points in the Mario Party 4 minigame Butterfly Blitz. There are three kinds of butterflies that give players points; yellow butterflies are worth one point, red butterflies are worth two points, and blue butterflies are worth three points. ↑ Hodgson, David S J, Bryan Stratton, and Stephen Stratton. Super Mario Sunshine Prima Official Strategy Guide. Page 19. ↑ YouTube video of a butterfly exploding on Mario. This page was last edited on March 29, 2019, at 16:02.